At first glance the Lotus Exige S may look like a racing car with number plates, but its supple suspension and big V6 engine, actually makes it a terrific road car as well as a rapid track day warrior. Interested in buying a Lotus Exige? Some cars look fast even stood still. Take the Lotus Exige S for example – every detail is sharp and purposeful – designed to cleave and shape the air over one of its wings or through a cooling duct. Now much longer than the Elise, and directly inspired by Group C racing cars, the Exige has a significantly stockier tail than before, which gives it a more balanced silhouette. Tiny wing mirrors, doors and a raised rear wing complete the motorsport design. However, if you’d prefer a slightly more subtle look, go for the Roadster, which does without the splitter and spoiler of the coupe. Squeeze into the slim bucket seat of the Lotus Exige S and you are greeted by one of the most purposeful cockpits produced by a car manufacturer. Only looking at the scenery through the windscreen reminds you this is indeed a road car, and you’re not on the grid at Le Mans. For those who appreciate driving, its unapologetically sparse layout is anything but ugly. Bare aluminium struts, a dessert plate-sized steering wheel and delicate dials are more motorbike than Mercedes SLK. It can’t fail to raise your pulse, but, whether or not your passenger has the same appreciation is another matter entirely. Stop laughing at the back. It’s more day at the races than weekend in St. Tropez. The boot is located beneath the rear hatch, in a compartment isolated from the engine and is big enough for one large rucksack. For its track-day role, this betters the Ariel Atom, and is not far off a Caterham. But, if you are thinking of the Exige as a Porsche 911 GT3 rival, this lack of space could be an issue for longer trips. Only its seats adjust (the steering wheel is fixed) and anyone far over six feet tall will struggle to fit inside. Rear visibility is improved over the previous Exige, but parking sensors are welcome as the mirrors are tiny and sitting so low to the ground can make distances hard to judge. It’s simply otherworldly, and you don’t have to possess a racing license to tap into the action. The Exige S is significantly longer and wider than the Elise and has rear suspension inspired by the Lotus Evora. This has given it the stability to carry so much speed it’s simply in a different performance class to the outgoing Exige – a car no one called tardy. 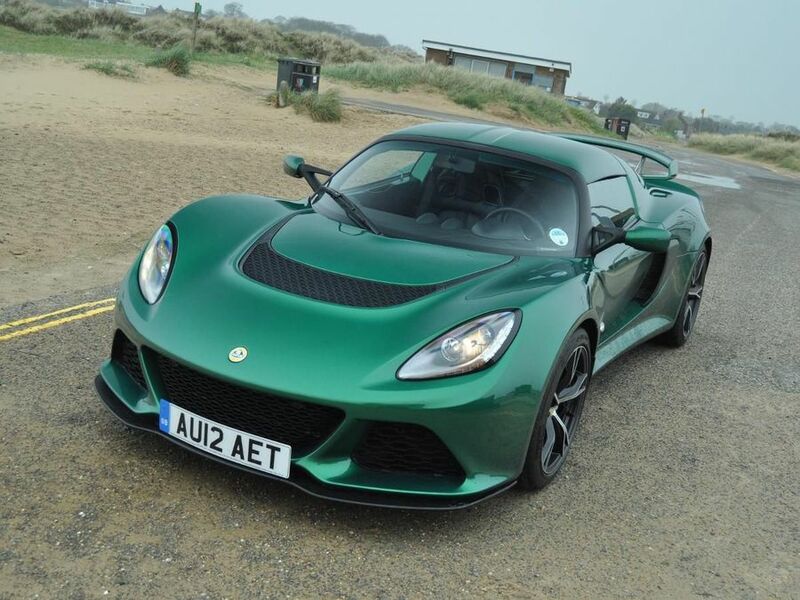 Around Lotus’ own 2.2-mile test track the Exige S is five seconds quicker per lap than the last Exige, a point of difference so vast Bernie Ecclestone could see it from space. If the standard car isn’t awesome enough, you can also specify Lotus’ optional race pack, which stiffens the suspension by around 15 per cent, includes track-orientated tyres (not suitable for wet roads) and adds a ‘Race’ mode to the stability control system. On the road, this setup is not as extreme as you might think and most surface imperfections fail to upset its composure. Only the heavy unassisted steering and significant wind and tyre roar start to make long trips uncomfortable. Visibility is surprisingly good and the small size and telepathic steering found in the Exige S fills you with confidence. Instead of being the twitchy and difficult car to drive you might expect, it is in fact approachable and rewarding. The engine is the same 3.5-litre supercharged V6 from the Evora S, with 345bhp and 295lb/ft of torque. That gets this Lotus – whether it’s the coupe or roadster – to 62mph in 3.8 seconds (the same as a £110,000 Porsche 911 Turbo) and even more astonishingly, the coupe from zero to 100mph in 8.5 seconds. A selector knob offers ‘Touring’, ‘Sport’ and ‘Race’ settings to tailor the driving experience to your situation and skill levels. ‘Touring’ quietens the exhaust and does its upmost to keep the car safe and stable, even if you bury the throttle in a wet bend. ‘Sport’ is described by Lotus as the ‘fun’ setting. It opens a valve in the exhaust, makes the engine more responsive and allows for more oversteer before it will intervene. ‘Race’ is contrary to what you might expect. Rather than making the car even wilder, it uses an advanced new development of stability control co-developed with Bosch to learn the grip of the track or road you are driving on and provide maximum traction. It’s quite uncanny and allows even Lotus’ own pro drivers to lap a circuit faster than they can without it selected. Steer through the corner, hit the apex, nail the throttle and even on a wet or greasy track it will find every ounce of grip and fire you down the next straight. The Exige and Elise have always had incredibly low running costs given the level of performance they offer. This has primarily been a result of their light weight – which makes them far kinder on all their mechanical components than stodgier machinery. Tyres and brakes are the most obvious benefiters – an important fact, as anyone who has shredded a set of black circles in a single day will attest. We drove around ten quick laps of Lotus’ test track without any part of the car feeling hot or bothered (except, perhaps, the driver). That big V6 engine does mean economy has suffered though, and Lotus now quote 28mpg and 236g/km of CO2. Lotus has incredible pedigree and has been building Elise-based models since 1996. While the Exige S is clearly a big evolutionary step, it still uses tried and tested technology for the production line at Hethel where it is hand-built. Normally this is where we mention airbags (the Exige has two by the way), but really the main safety feature of the Exige is its incredible handling and brakes – aided by its finely tuned stability control system. Should the worst happen, the Exige has a hugely strong body structure. Stepping over its wide side sills might not make getting in and out particularly elegant, but you do feel especially cocooned once ensconced in the cabin. While you might correctly assume this is no Mercedes S-Class, there are some surprises as far as equipment is concerned. While purists might say it adds weight, we were pretty glad the Exige S had air-con during our test drive, both to clear condensation and cool us down after some committed driving. Heated seats were a surprise, but we can see the logic as the bare metal cabin must get icey cool in winter. A stereo is fitted too, but sadly it is fighting a losing battle at anything above 60mph. You can look at the Exige S in two ways. Either you think it’s a heck of a lot of money for a souped up Elise, or that it’s a bargain for a car which hits 62mph in 3.8 seconds and will out handle almost any other car in the world, all while making you feel like a driving god. As you may have guessed, we fall into the latter camp.